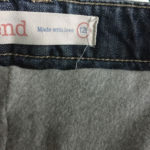 Home / blogs / craftiness / for wearing / maternity / Jeans to skirt upcycle- with added maternity benefits! So that is exactly what I did with my old pair of well loved boyfriend jeans from Next. The added incentive for me was that I also have an ever expanding bump which is gradually reducing the pool of clothes that I am able to fit into, and as I am going to be at my biggest in the summer months I wanted to make something that I could wear through that time. 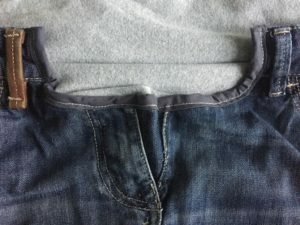 I had googled converting jeans to skirts before and got some general tips from other articles about where to cut through the legs etc. I’d also looked at a couple of articles converting jeans to maternity jeans with stretchy panels to replace parts of the waistband. As this was my first attempt at converting a piece of clothing I knew there was a fair chance that I could muck this up but hey, worst that would happen is that they would be in the bin which is where they were headed already right? I started by cutting the legs up through the inside seams and through the crotch. Pretty easy and straightforward. Next came cutting out some bump space. I had decided to buy some maternity clothing, 2 pairs of jeans and some black work trousers – I went for the ones with an over bump panel, I bought them at 18 weeks when my bump just about starting to show, and they are sooo comfortable, I definitely prefer them to under bump stretchy style. 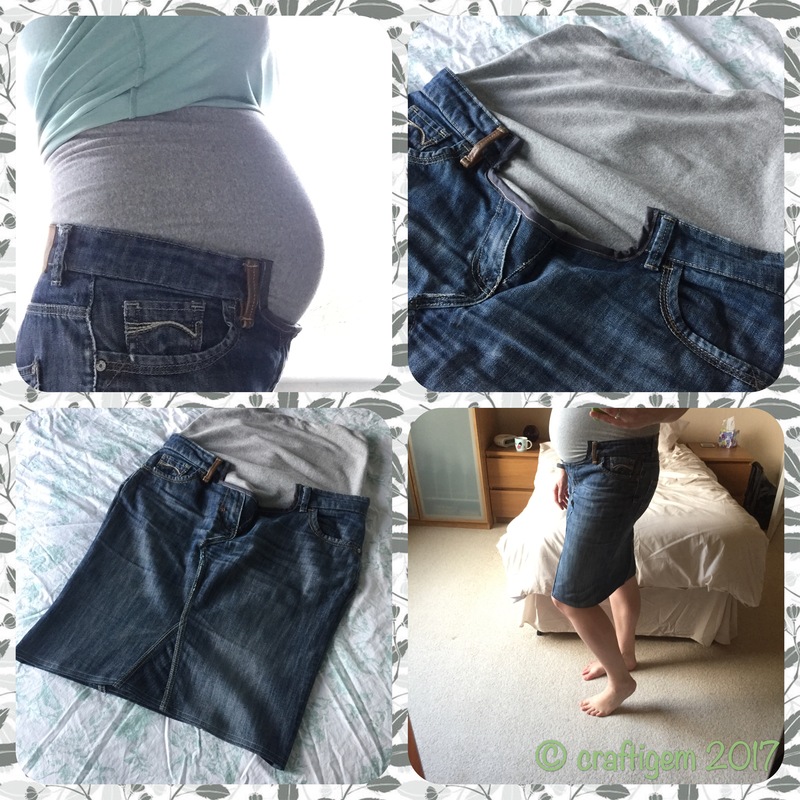 I wanted my skirt to be an over bump as well, but all the maternity jeans conversions I had seen online were under bump conversions, so I thought the best thing to do with my conversion was to model the cut and panel on the jeans I had bought. I wore my maternity jeans and put the cut open jeans over the top to get an idea of where they would sit and where I would cut, then I took a water soluble fabric pen and marked out where my cut lines would be. I decided to keep the original jeans waistband as much as I could, as there is some nice leather belt loops and detailing that I could keep. I put the entire width of the waistband and zipper from the front, leaving a small v from the open fly which I then patched by sewing in some of the excess leg fabric after I decided on my length. The next part was joining the two legs at the front and back to make the front and back of the skirt- this involved overlapping the points of the crotch you cut out which leaves a triangle down to the end of the skirt which I ultimately filled in with spare leg fabric. A quick try on again and I decided that the skirt needed some shaping down the legs to make it less A-line and more pencil skirt ( I don’t suit A-line). I decided to take the length to the knee and shaped by taking in the sides of the skirt from the top of the thigh down to the length to create the shape. The final part was to take the spare leg fabric I cut from the length and patch into the triangle at the front and back, then hem the thing. This finished all the jeans work- I didn’t worry too much about my inside edges, I had started to overlock them to protect from fraying but it was taking too long and I was too excited to finish my project and wear it so I ended up cutting with zig-zag scissors and they have held up in the wash fine. So the over bump piece! 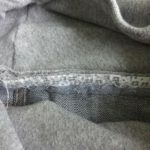 I went back to my maternity jeans and studied the bump panel to work out the shape and how it was made. The panel was a doubled over piece of stretch jersey material with a strip of ½” elastic at the top that goes under your bust. 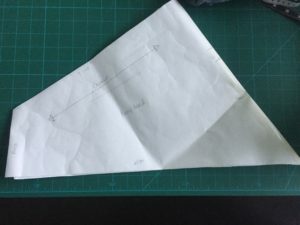 The shape ended up as a sort of triangle- here is a picture of the pattern piece I made of it. Once cut I sewed the elastic in first then joined the ends in a round where the seam would then be at the back of the skirt and then sewed the whole band to the inside seam of the waistband in the skirt (pictured here). I tidied up the front part I had cut out the jeans where my bump will be with some bias binding and it was all finished! I’m really pleased with the result, as my collage shows it fits nice over my bump and the length is great! I got too excited whilst I was making it to take many pictures but I think I’m going to make another from a set of jeans my brother was throwing out so I may well make a proper tutorial to go with that!